This year, more than 131 million Americans are expected to go online for the shopping extravaganza nicknamed "Cyber Monday," according to data published by the National Retail Federation (NRF), up from 129 million in 2012. Consumers making the most of online deals - and the intense competition between retailers in the lead-up to Christmas -- have also proved a boon for delivery firms, with courier Fedex expecting to ship 22 million packages worldwide on Monday. Spending over the Thanksgiving weekend is expected to have declined 2.9 percent, however, an NRF survey of 4,500 shoppers revealed. "A lot of e-commerce businesses or multichannel retailers have really improved their offer and made it more efficient - you no longer need three weeks to guarantee delivery before Christmas as many retailers offer same or next-day delivery." "Black Friday" is the latest American export to influence shoppers on the other side of the Atlantic too, analysts have noted. 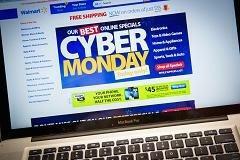 Global research group Experian expects visits to U.K. retail websites to reach 113 million on Cyber Monday too. Kantor's Roberts expected online auction house Ebay, retailer Amazon and discount chain Argos to be the most visited websites on Monday. "What 'Black Friday' might be doing, as it gains traction in markets like the U.K., is to bring spending forward rather than it being incremental."